This entry reads, "Smith, Riley, 1588, Y & L Ret, Depot Des Prissonniers de Guerre, Philippopoles, Bulgaria (King's Head Hotel, Barnsley)"
It caught my eye because of the pub name, the King's Head Hotel, Barnsley. This pub no longer exists, but it was on Market Hill. The address at which he was imprisoned also leapt out as there are only two prisoners on the list who were held in Bulgaria, the other being Ernest Lomas, also in the Yorks and Lancs, and I wanted to know how they got there. I was able to find Riley Smith's World War One Service records and Medal Card on Ancestry without too much trouble - handy having an unusual name. He enlists in 1915, but maybe because he was a married man, he was allocated to the 15th York and Lancs battalion, the reserve although his regimental number is 14/1588 suggesting he was initially enlisted in the 14th battalion, the 2nd Barnsley Pals. 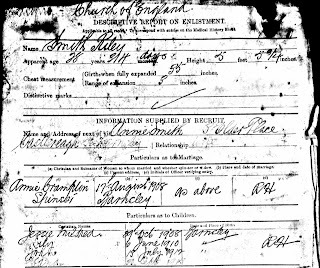 Riley marries Annie Crampton in August 1908, when his occupation is given a Butcher and his address 31 Bond Road, Barnsley. This address is a end terrace house towards the top of Bond Road, which is in the Old Town area of Barnsley. A nice little house in a nicer part of town, a pleasant suburb I expect in contrast to the packed courts and lanes of New Street and the town centre. Within three years Riley and Annie have two daughters, Jessie born in 1908 and Lily born in 1910. In the 1911 census the family are living at 11 Blenheim Road, which is a mid terraced house on the edge of Barnsley town centre, near to St George's church. Riley completes the census return himself, declaring he is a Butcher and that their house has four rooms. He signs the return - the 1911 census is the first time we are able to see the actual handwriting of the householder on the individual household schedules, prior to this the entries we see in the 1841-1901 census returns are the transcriptions by the census enumerator into his books from the individual returns which were then destroyed. The First World War breaks out in August 1914 - the general feeling is that it will be over quickly, there hadn't been a long drawn out European war for many years. Young men in Barnsley rush to volunteer to join the army, keen not to 'miss out'. By the beginning of 1915 two new battalions of the York and Lancaster Regiment, the 13th and 14th, known as the 1st and 2nd Barnsley Pals have been recruited and are in training at Silkstone Camp. World War One soldiers' records were stored in central London during World War Two, and unfortunately the building was damaged during the blitz. Over 60% of the records were destroyed and many others were burnt or water damaged. The above snip is from Riley Smith's record - one of the surviving records but you can see the damage to the top and edges of the sheet of paper. 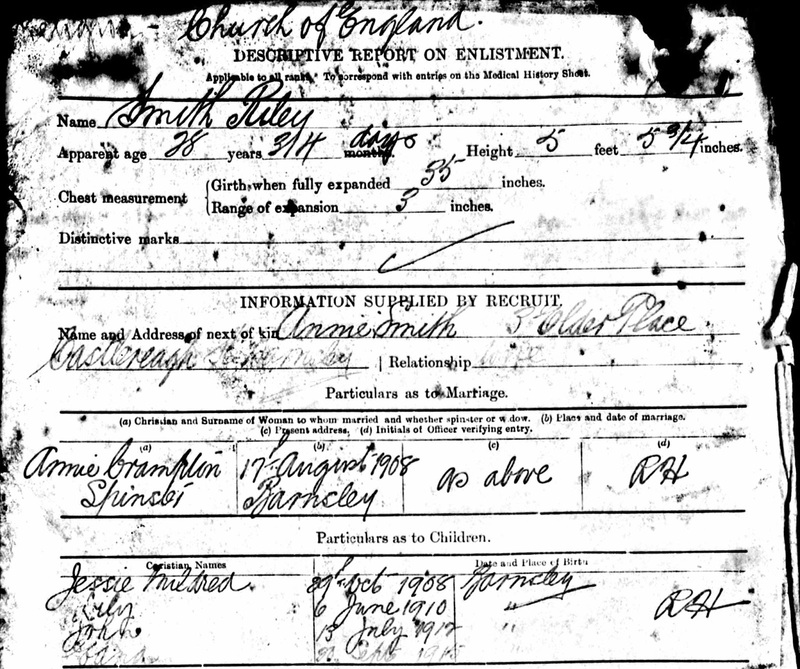 Riley was 28 years old when he enlisted in November 1915 - he volunteered, conscription did not begin until the following year and even then married men were exempted for a little while longer. Knowing that conscription was coming in he may have decided to volunteer while he still had a choice about which unit to serve in. He was enlisted into the 14th York and Lancs with service number 14/1588, and reports to Silkstone to join the rest of the battalion but seems to have been transferred to the reserve soon afterwards. The Descriptive Report on Enlistment shown above gives all kinds of interesting family information. Annie is given as Riley's next of kin and their home address was 3 Elder Place, off Castlereagh Street. Elder Place is not very large, nestled between Castlereagh Street, Nelson Street and Blucher Street. Whichever house No 3 was it was much smaller than any of Riley's previous addresses and probably a back to back - I'm guessing the three squareish shapes at the top of the yard are the houses, with privies to the right and some kind of industrial buildings at the opening of the yard. A ring road, the Westway, runs right through this area now with the Holy Rood church and the Salem Chapel still surviving on either side of the dual carriageway. The map above is part of one of a collection held by the Barnsley Family History Society, donated to them after an office clearout you can see where someone has drawn a couple of rough lines to show the route of the new road. The Smiths now have four children, Jessie and Lily, plus John born in 1912 and Edna born in 1915. The birth dates of each child and the date of Annie and Riley's marriage are all included in this document. As I suspected on seeing the age of Jessie in the 1911 census she was born just two months after their marriage - but this wasn't an uncommon occurrence then or now! Annie must have needed to be a strong woman to face seeing Riley go off to war leaving her with four children under ten years of age to care for. I hope she had support from family. Another smudged and blotchy page from Riley Smith's Service Record shows that in late 1916 he was posted to Sunderland to join the Mediterranean Expeditionary Force. He arrived in Salonica (now Thessaloniki) in September 1916. The British had a force in Greece to "help the Serbs in their fight against Bulgarian aggression" (The Long, Long Trail). Forces would have been sent to join them periodically to help hold the position and in 1916 the position was dug in and reinforced. Although it is very hard to read Riley's record notes that he was reported 'Missing in the field' on 11 October 1916. The next note says that he was 'unofficially a POW' and then in March 1917 he is recorded as 'officially accepted POW war office no.5572'. The date of his disappearance does not tally with any of the battles in that area, there were some advances between the 30 September and 4 October, but then it is (relatively) quiet until the middle of November. We can only assume that he was assisting in recovering wounded or dead after the captures of Karajakois and Yenikoi in northern Turkey, on the edge of the Black Sea, near the border with Bulgaria. There is very little information on line about what might have happened to Riley next - there is one more clue in his records. The word Phillipopolis is entered just below the official recognition of his capture, this tallies with the entry in the Barnsley Chronicle. The name of this Bulgarian city, has changed over time, it is now Plovdiv, and can be seen at the centre of the map snip above. It was the site of a large Prisoner of War Camp according to a discussion to be found on the Great War Forum. You can also see Thessaloniki to the bottom left of the map snip where Riley disembarked from his ship and the actions in that area when Riley may have been captured are on the curving edge of the Turkish coast with the Black Sea to the right of the snip. Riley spends the rest of the war in what were apparently very harsh conditions, with little food and poor accommodation. He is returned to England after the Armistice in November 1918. He does not claim to be suffering any disability or illness that would have given him a pension although a wound is noted on his record dating from his capture. He returns to his life in Barnsley with Annie and the family in March 1919 when he is discharged. They have no further children, and he dies in 1931 aged just 43 years old. He is buried in Barnsley Cemetery and the address given as his place of death is 3 Elder Place. The family lived for at least another eleven years in that little house off Castlereagh Street - and he died relatively young. Was his health affected by his imprisonment? Annie dies in 1971, she does not remarry and she is buried in the same grave as Riley. By this time she is living in Kendray a large council estate built in the 1930s to the south of Barnsley, a much nicer environment than Elder Place I am sure. On another occasion I will try to find out what happened to the other Barnsley man held in Bulgaria, Ernest Lomas - unfortunately his service records do not appear to have survived the blitz.